Drag within the image to explore the Rostellan Dolmen in virtual reality. Touch here for the Google Cardboard version. 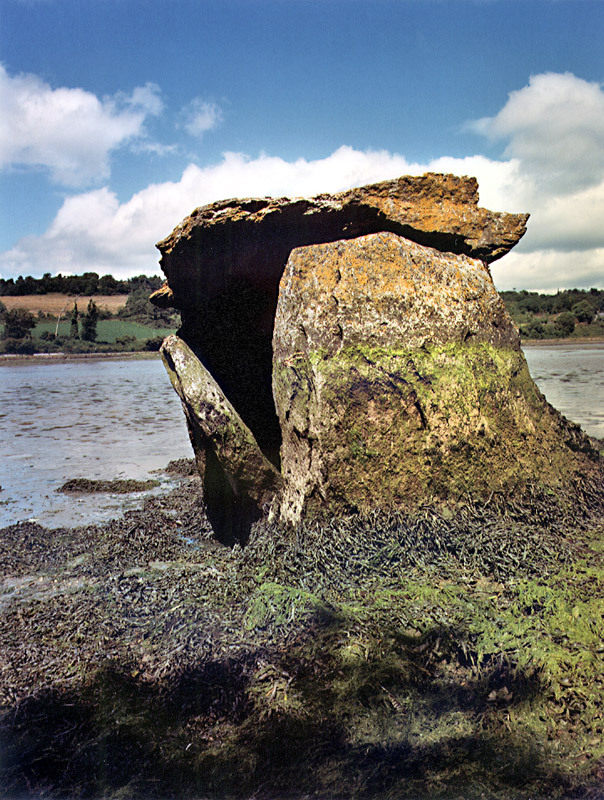 Nearly submerged by the tidal waters of Cork Harbor’s Saleen Creek, the Rostellan Dolmen (portal tomb) is the only example of such a Leaba Dhiarmada agus Gráinne (Diarmuid and Gráinne’s Bed) in Ireland to wear a garland of seaweed. It is also unique in that it opens to the east, rather than facing the setting sun, as does the normal, land-locked portal tomb.2 There is no trail leading to it, nor is it mentioned in most modern guidebooks. The Shell Guide of 1967 calls it Carraig a’ Mhaistin, which may mean “Bully Rock.”3 While it now sits in the sea ten meters (33 ft) below the high-tide mark, when it was built in the Early Neolithic the oceans were lower and it likely sat on beachfront, rather than aquatic, property. 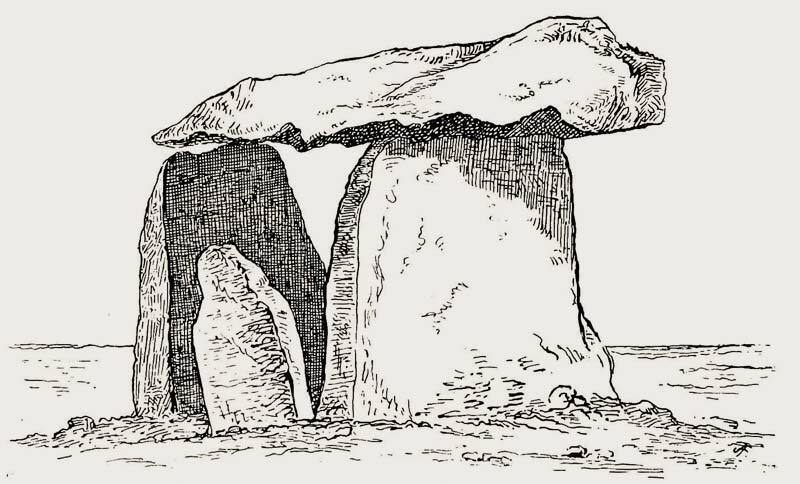 A kilometer to the west along the rocky shoreline are the crumbling ruins of “Siddons’ Tower,” built in 1727.4 Other shoreline megalitihic monuments featured in Voices from the Dawn include the Knockbrack Chambered Tomb and the Altar Wedge Tomb. 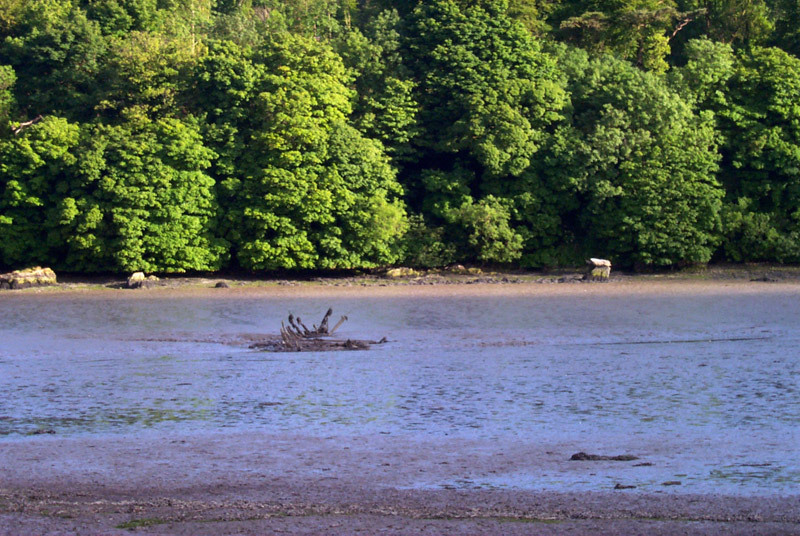 A distant view of the dolmen may be had from Church View Road, in Saleen, across the estuary. The dolmen is just visible on the opposite shore. But direct access to the tomb itself can be problematic. At low tide, with a walking stick and a pair of Wellingtons it is about a kilometer (.6 mile) walk from the closest seaside parking area, along the rocky shore though slippery hillocks of kelp and sea lettuce. 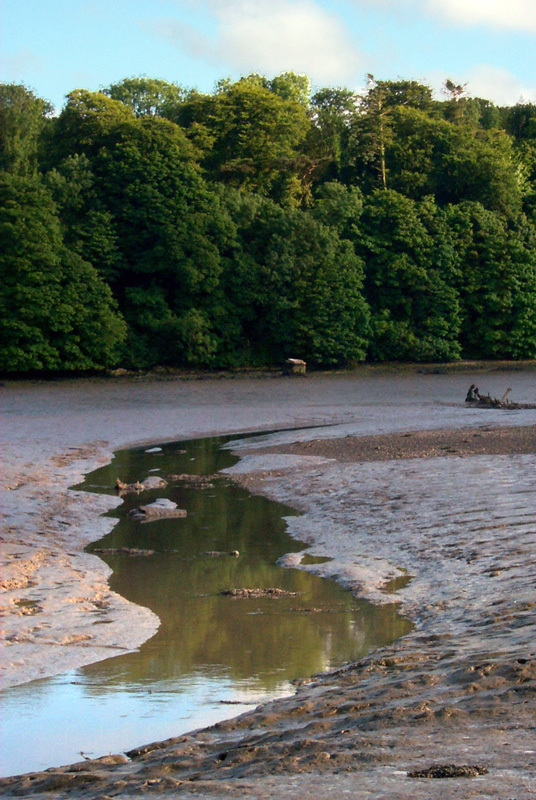 There is also a route down toward the estuary from the Rostellan Woods car park, but the path may disappear before it reaches the shore, necessitating a length of trail blazing through the stinging nettles. 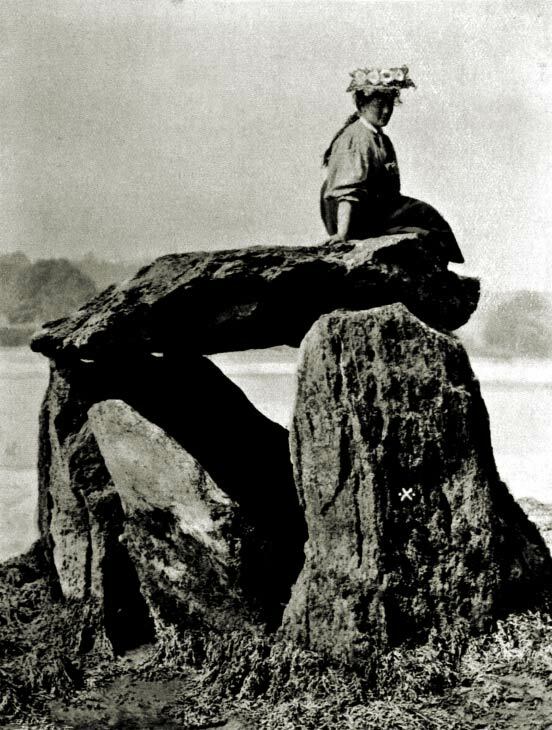 The dolmen can be much more easily accessed within the virtual-reality environment above. 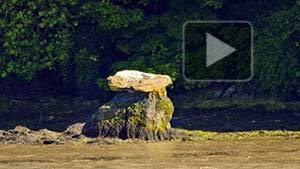 Click the “play” button to cycle the tides. 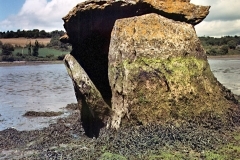 Click the red hotspot to see a closer view of the dolmen at low tide. If you view the telephoto-lens VR (below, left) in full-screen mode you can find shore birds in the tidal mud flats. 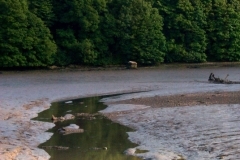 You will also see the skeletal remains of a boat exposed at the low tide. The betrayal of Fionn began at the wedding feast, where the warrior, already quite old, was to be married to the young and beautiful Gráinne, daughter of the king. But Gráinne took a liking to a striking young man, one of Fionn’s warriors, named Diarmuid. It seems that the youth had on his forehead a mole that caused any woman who caught sight of it to fall hopelessly in love with him. Gráinne gave a sleeping potion to most of those gathered at the wedding, and then laid magic-bonds (faoi ghessa) on the youth to run away with her. While Diarmuid did not wish to break the trust of his chieftain, his will was broken by the strength of Gráinne’s ghessa. At first Diarmuid resisted sleeping with Gráinne out of respect for Fionn. But after she teased him that some water that splashed on her leg was more daring than he, Diarmuid relented and they become lovers. Fionn Mac Cumhaill pursued the pair throughout the land for a year and a day, using the powers of magical vision enabled by his biting down on his thumb. Eventually, with the mediation of Aonghus Óg, Diarmuid’s protector, Fionn pardoned the couple. They settled down and bore five children. But one day, while out on a boar hunt with Fionn on Ben Bulben, Diarmuid was horribly wounded. Fionn had the power to heal him by allowing him a drink of water from his hands. 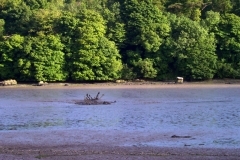 "The Submerged Cromleac, Rostellan, from the South-West. The cross shows high-water mark." 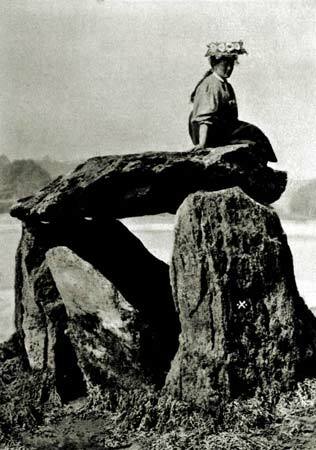 Photo by R. Welch, from The Irish Naturalist, September, 1907.
near a river in a wooded clearing. They are fugitives. Intimates of myth. I ought to tell their story and I will. the same sound as shadow. Can you hear it? Daylight greys in the preceptories. pivoting the planets of a harsh nativity. They were never mine. This is mine. This sequence of evicted possibilities. Displaced facts. Tricks of light. Reflections. Invention. Legend. Myth. What you will. The shifts and fluencies are infinite.